At Fusion Painting, we do more than provide our clients with residential painting services. 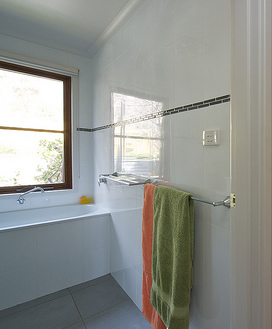 Rob Vuckovic, Director of Fusion, is a licensed builder and professional Canberra bathroom remodeling contractor. If you have a bathroom renovation project in mind, he will manage the process from the initial bathroom design right through to completion. Working with our talented interior designer, we have remodelled some beautiful bathrooms. We work with you to determine your needs, and use the very best tradesman to ensure a high quality finish. We have built up strong relationships with experienced and careful plumbers, electricians and tilers. Whatever your bathroom remodel needs, from the installation of new cabinets or bathroom vanities to tile flooring and interior painting, the professional Canberra painters and remodeling specialists at Fusion Painting can take care of it with precision and ease. Let us transform your bathroom into something you can be proud of - call Fusion Painting today at 0417 685 211 to get started. If you are looking for a Canberra Bathroom Remodeling Contractor then please call 0417 685 211 or complete our online request form.